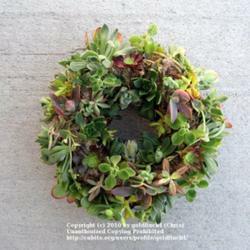 The directions for making a succulent wreath are very simple. The same method can be used for any topiary form using sedum or sempervivum. The directions below are for using semps and a wreath frame. For my sempervivum wreath I purchased forms that were already stuffed with long fiber sphagnum moss. I got them on line from Topiary Art Works, but there are lots of places on the internet that sell them. I like their frames because t hey’re heavy duty, already packed with moss and are tightly wrapped with mono filament. They have a chain with a ring on the end for hanging them and on the back of the frame are 3 short legs. The legs will hold the wreath off the wall for air movement or you can place them on a table if you’d like. Before I started I soaked the wreath in water for about 10 minutes, then let it sit overnight to dry a bit. The only tool you really need is a pencil or screwdriver. Using your tool loosen the moss slightly and tuck the roots of the semps into the moss. You shouldn't bury the semps, just put them deep enough to sit snugly in the moss; now push the moss back around them as much as possible. Because semps have such a shallow root system, I used topiary pins to hold them on the wreath for a few weeks. 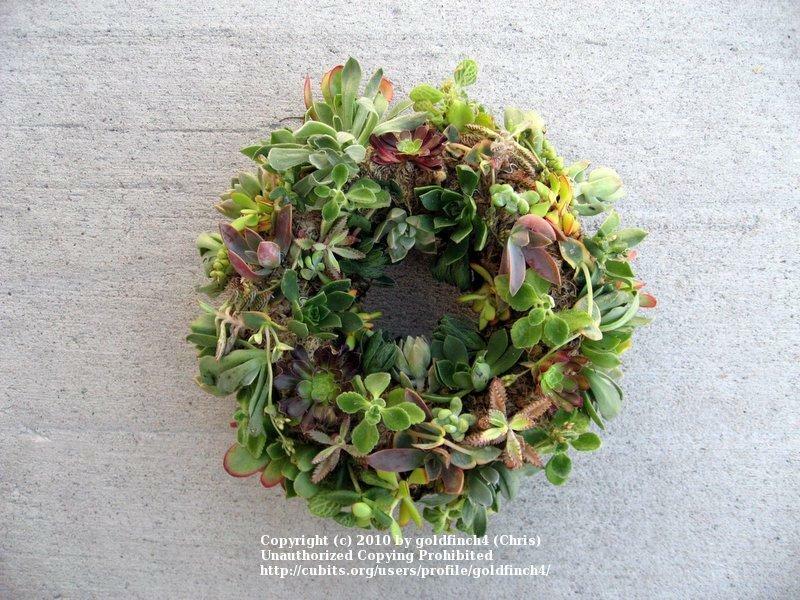 Let the wreath lay on the ground or a table until the semps start to grow into the moss. After that you can remove the pins. Note that squirrels and chipmunks think its great fun to pull the semps out of the wreath – one hazard of leaving them laying on the ground. You’ll need to make sure the wreath gets watered occasionally, but as you know, semps don’t need too much moisture. To water them you can stick the entire wreath into a tub of water for about 10 minutes. (It'll probably sink.) It would seem that they’d get too water logged, but it didn’t hurt the plants at all and I didn’t have any trouble with rotting. Since there are no nutrients in the moss, about twice during the summer I put a small amount of liquid Miracle Grow in the tub when I soaked them. This method works great when it’s been really hot and dry. Otherwise I just gave them a light watering with the hose once in a while. I also want to mention that there are several different kinds of wreath frames. Another type comes in 2 pieces. It may just be a frame or may already be “packed” for you. It usually has sphagnum moss around the outside but there is also a layer of dirt inside the moss. These are great for planting annuals in as well. Here are links for buying plants for your wreaths and topiary. Good luck and have lots of fun. If you have pictures, please share!